I can’t stop sneezing! It’s a common complaint among the general public, especially during the cold and flu or allergy seasons. A sneeze is the body’s response to an internal action, or a reaction to an environmental trigger. When you suffer from constant sneezing, there may be factors more serious than meets the eye—or nose in this case. While a sneeze is usually not cause for concern, it can develop into chronic sneezing and therefore stimulate other reactions of the body. We will uncover the causes of such a condition and the best advice on how to stop sneezing. What is sneezing? It is described as an involuntary sharp expulsion of air through the mouth and nose due to an irritant in the lining of the nasal canal or throat. This can be caused by internal and external factors such as upper respiratory illness, environmental pollutants, lifestyle habits, spicy foods, or medications. Some cases of sneezing can be brought on by a condition known as photic sneeze reflex. With this disorder, patients sneeze when exposed to brightness such as sunlight. Depending on the cause, uncontrollable sneezing may be accompanied by coughing, sore throat, nasal congestion, runny nose, watery eyes, fever, and chills. We will discuss the various conditions and factors that may stimulate a chronic sneezing pattern. The following reasons may answer your “why am I sneezing” questions. Why do I sneeze so much in a row? A common condition called allergic rhinitis can cause persistent sneezing. Sneezing is often accompanied by itchy and watery eyes, nasal congestion, and a runny nose. Allergies can be seasonal, occurring at various times of the year when you are more susceptible to environmental triggers such as pollen. Pollen is known to cling to a person’s clothes and hair when exposed in the air. Perennial allergies cause issues year-round with exposure to scents, pet dander and hair, or dust mites. Some cases of constant sneezing may also be attributed to oral allergy syndrome, wherein a piece of fruit is mistaken for an allergen. An itchy throat with a tingling sensation in the mouth can occur with sneezing while eating melons, apples, bananas, and peaches. Chronic upper respiratory illnesses such as cold or flu infections can stimulate sneezing. Known as infectious rhinitis, it may be caused by a bacterium or virus such as rhinovirus or adenovirus. An infection in the sinus cavity can also cause constant sneezing as can the rare fungal infection. Your nasal and throat passages can become irritated by systemic, airborne, and even consumed invaders. Irritants can include dry weather, cold weather or temperatures, cigarette smoke, perfume scents, environmental pollution, spicy foods, hormone level changes, and stress. Any one or more of these can trigger chronic sneezing. Common household irritants include the mold that forms in the soil of potted plants. Why am I sneezing so much all of a sudden? Certain medications may cause the nasal passages to become extremely dry, while others may stimulate a drug-induced rhinitis. Your sneezing episodes may become prevalent with the use of antidepressants, sedatives, erectile dysfunction medication, oral contraceptives, diuretics, hypertension medication, or non-steroidal anti-inflammatory drugs. Ironically, if you use nasal decongestants to resolve nasal congestion, overuse may cause rhinitis to return and the sneezing could progress. In addition to the reasons detailed, several other conditions can stimulate chronic sneezing. It may occur with nasal polyps, neurological issues, and tobacco and cocaine sniffing. Professional and avid swimmers may also react to the chlorine with itchy watery eyes and sneezing fits. How can I stop sneezing? Sneezing is a natural response, but can be embarrassing when constant and in public places. We have compiled a list of sneezing treatment tips that may help you out. Blow your nose to remove any irritants from your sinuses and nasal pathways. Squeeze the nose gently but firmly, pulling it outward by grasping above the tip. This stretches the cartilage to stop the sneeze. Pinch the upper lip with the thumb and forefinger gently and push up toward the nose, with thumb at the opening of one nostril and forefinger at the other. Press tongue firmly where the roof of the mouth joins the alveolar ridge, just at the bulge behind the top front teeth. Hold until sensation dissipates. Stick out your tongue one inch from the surface of a table or counter with your head facing down. Hold for five to seven seconds. Use your tongue to tickle the roof of your mouth as the sneeze sensation arises. Continue for five to 10 seconds or until the sensation disappears. Distract yourself from the sneezing by pinching the skin between the thumb and fingers on one hand. Pinch the area on the forehead between the eyebrows to stop sneezing. This is the same pressure point used to treat headaches. Wiggle your ear lobe with your fingers whenever the sensation of a sneeze starts. Clench your teeth while trying to stick out your tongue. Other helpful methods to try to stop the sneezing include regularly changing any air or furnace filters in the home, washing linens in hot water, avoiding places with high pollen counts, and vacuuming and dusting on a regular basis. You may also want to use a humidifier or a dehumidifier, depending on the moisture levels in your home. Maintain a healthy immune system by following a diet high in vitamins C and D can prevent internal irritants from causing the chronic sneezing. Vitamin C is known to lower histamine production within the body. Add garlic and ginger to your favorite dishes. For instant relief, drink chamomile tea, which has antihistamine properties. Ingesting or inhaling certain essential oils could also boost the immune system and help prevent bouts of constant sneezing. The properties of peppermint oil, lavender oil, and lemon oil are often used to destroy any irritants within the lining of the nose and throat. If you can’t stop sneezing, you are not alone. Millions of people suffer from this chronic behavior thanks to the air we breathe, infections, and the response of our immune system to irritants. Be aware of any medications you are taking as the components could be causing your sneezing. Different causes can offer similar accompanying symptoms such as runny nose, congestion, and itchy watery eyes. Before you reach for a nasal spray or decongestant, which may worsen your sneezing, try some of the unconventional treatments we found. Conrad Stoppler, M., MD, “Sneezing,” Medicine Net; http://www.medicinenet.com/sneezing/symptoms.htm, last accessed July 27, 2017. 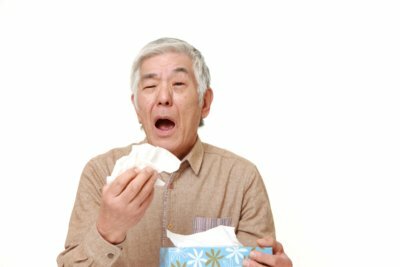 “5 Surprising Reasons You Can’t Stop Sneezing,” Beauty & Confidence; http://www.beautyandconfidence.com/health/5-surprising-reasons-you-cant-stop-sneezing/index.php, last accessed July 27, 2017. “Wiki How To Stop Sneezing,” Wiki How; http://www.wikihow.com/Stop-a-Sneeze, last accessed July 27, 2017. “How To Help Stop Sneezing: 4 Top Aids,” Vicks; https://vicks.com/en-us/treatments/how-to-treat-nasal-congestion-and-sneezing/how-to-help-stop-sneezing, last accessed July 27, 2017.